Universalhunt.com is one of the world’s leading online professional network and career portal with more than million users. It provides a rich source of informational interviewing, leads for networking, and internship and job opportunities. Once you are a registered member, the next step is to create an eye-catching and informative profile to showcase your expertise and interests. Universalhunt.com is a global professional networking and career portal, so it is highly recommended that you select a high-quality headshot of you alone. Once you start networking with professionals across the globe, you will want them to remember what you look like and ensure that they are connecting with the right person. Your statement of the summary should resemble your resume, concise and confident about your goals, experience, and relevant internships. Present your summary in bullet points for easy reading. The best place to find keywords is in the job listings that interest you and the profiles of candidates/professionals who are currently holding the kinds of positions you want. It’s good to update your status at least once in a week to enhance your professional image. Tell people about the events you are attending, articles that you have read or recommend. Add your sample work or projects like designing, articles, or any other accomplishments. You can also include social links to direct people to showcase your strong professional background. Mention your total experience in the industry including internships, volunteer work etc. Start with your recent experience and then by expanding where you started. 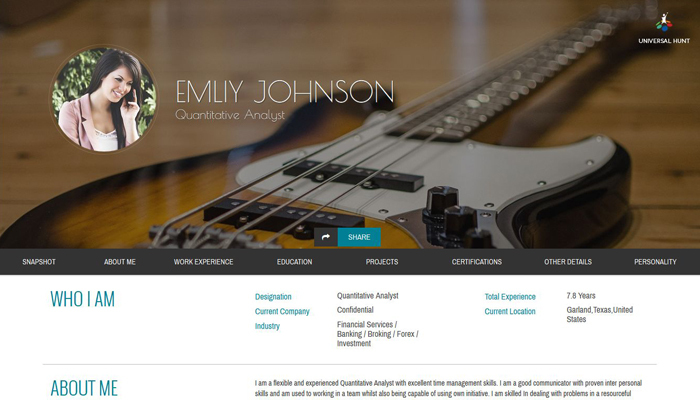 Make your experience you mention on profile should match with your resume. Remember, making good first-degree connections is the first step toward success. So start using these Universalhunt profile tips now to improve your professional brand and getting found.